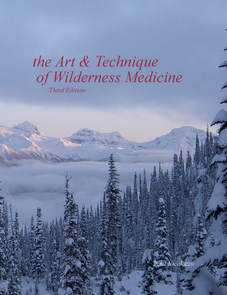 The third edition of the Art & Technique of Wilderness Medicine is a true 8.5 X 11 inch full color text book with 607 photographs, 184 drawings, and 55 charts & tables. Problems are broken down by mechanism of injury or illness into three major categories: trauma, environmental, and medical. Decision trees (algorithms) precede each major section to help you identify possible problems quickly. Important assessment and treatment information is bulleted. Anatomy, physiology, and pathophysiology are discussed in depth. Additional sections include: medical legal considerations in wilderness medicine, basic life support, infectious diseases, patient assessment system, basic pharmacology, and first aid kits. The third edition adds a number of new topics and updates others. It was edited by nine WMTC graduates for clarity. It is the BEST instructional text available in print today for wilderness and remote medicine. Soft bound; 281 pages. Discounted because we are closing out print editions of our textbooks and moving to digital. Look for a digital version in 2018, with free updates for life.